Secret Affair formed in 1978 and released their seminal debut album "Glory Boys" the following year. "The Glory Boys" was a smart-dressing youth movement based around the idea of 1960s gangster chic, influenced by the movie, "Performance." In a period of a little over two years, Secret Affair had five releases in the UK Singles Chart, and released three albums. The debut single "Time For Action" reached number 13 in the UK chart, putting them at the forefront of the 'Mod Revival' movement. More chart success followed with "Let Your Heart Dance", "My World", "Do You Know" and "Sound Of Confusion". 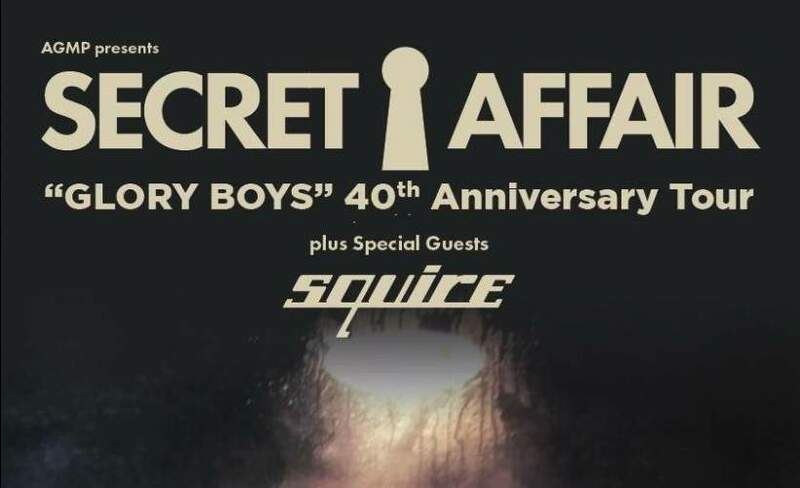 Secret Affair will be performing their debut album in full to celebrate the 40th anniversary of it's release + a selection of other Secret Affair classics. Squire were named after a shop called Squires which they originally rehearsed above. They released the first single of the 'Mod Revival' genre "Get Ready to Go" in March 1979. Fronted by Anthony Meynell, Squire released two fantastic singles for Arista - "Walking Down The Kings Road", with anthemic "Its A Mod, Mod World" on the flip side, and "Face Of Youth Today", and a fourth "My Mind Goes Round In Circles" featured Kirsty MacColl on vocals. Squire went on to record five albums and ten singles, including the sunshine pop album "Get Smart" in 1983, and the groundbreaking "September Gurls" album in 1984, the title track a cover of Big Star’s then undiscovered classic.